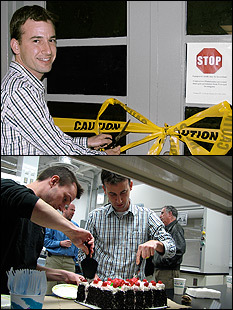 Above: Professor Oded Rabin hosts a ribbon cutting ceremony for the opening of the lab. Below: The lab's first, crucial experiment involved the deposition of biocompatible carbohydrates, fats and proteins on paper substrates to form a composite macromolecular structure with layers of varying characteristics. The subsequent complete dispersion of the material from the substrates suggests its efficacy for gastronomic applications. Further research is required to know for sure. Faculty, staff and students from the Department of Materials Science and Engineering (MSE) and the Institute for Research in Electronics and Applied Physics (IREAP) recently gathered to celebrate the official opening of the new Materials and Interface Nanotechnology Laboratory, directed by Assistant Professor Oded Rabin (MSE, IREAP). Rabin's research interests include nanowires, porous thin films and membranes, electrical and thermal transport in low dimensional systems, and interfacial nanoscience. Initial research projects at the lab will include investigations of the synthesis of metal nano-particles for applications in surface enhanced Raman spectroscopy, and on the growth of nanowires for applications in thermoelectric materials. When Rabin joined the department in Fall 2007, the lab's space, located in the IREAP building, had been used for storage for several years. "It was a very interesting challenge to learn about all the considerations that are involved in designing a lab, to communicate with contractors and project managers, to create a vision of the desired result, and to anticipate what may go wrong," he explains. "Bryan Quinn [Director of Technical Operations, Electrical and Computer Engineering (ECE)] assisted us throughout the process and helped us solve problems and prevent costly errors. Bryan, Joe Kselman [Engineering Technician, ECE] and Tom Norberg [Technical Operations Specialist, ECE] will continue assisting us with the smaller jobs that still need to be done to fit the lab for new tasks." During the extensive remodeling and the ordering and installation of equipment, Rabin and his research group worked in a shared IREAP lab, shared research facilities including the FabLab and NISPLab, and the labs of several MSE and other faculty members. "Thanks to the generous assistance of [Professors] John Cumings, Sang Bok Lee (Chemistry and Biochemistry), Gary Rubloff, Ichiro Takeuchi, and Manfred Wuttig, we had access to space and equipment we needed during that period," says Rabin. "I'd also like to thank [MSE Professor and Chair] Robert M. Briber, [Director of IREAP and Professor of Physics and Geology] Dan Lathrop, and [former Clark School dean] Nariman Farvadin for allocating the resources and making the support of new assistant professors a high priority." Rabin hopes to add several more members to his research group, which currently includes MSE graduate students Seung Yong Lee and Keith Gregorczyk, in the near future. "I am looking for a post-doc and any motivated graduate students who are interested in nanoscience," he tells us. "I am also glad to have undergraduates in the lab, working with grad students or independently." Students and prospective post-docs interested in working at the Materials and Interface Nanotechnology Laboratory can e-mail Professor Rabin at oded@umd.edu.